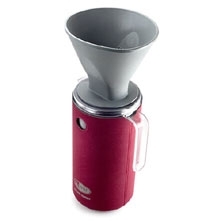 The best coffee solution yet for rafting trips. OK, to start out, my needs for coffee are probably not in line with most, but for overnight rafting trips with 10+ coffee drinkers this is the best system we've used yet. Past coffee making efforts have evolved from cowboy coffee (uck, just uck) to percolators (too slow and fussy) to Coleman auto-drips (too bulky and fragile) to the REI 48oz insulated French Press (too hard to clean) to a large #6 coffee cone and a Hydro Flask insulated growler (too easy to spill while pouring the hot water and large cone hard to pack). The system we use must be able to churn out large amounts of coffee fairly quickly, be able to keep brewed coffee hot for late risers, and pack up efficiently to fit into the kitchen box with all of the other kitchen stuff that goes in there like puzzle pieces. While not the be-all end-all solution in itself, the GSI 50 oz. Java Drip plays a strong leading role on the current all-star coffee team. 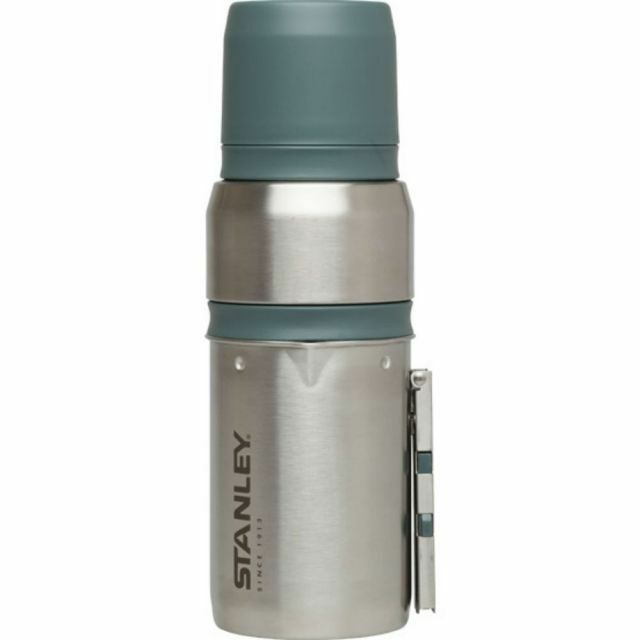 The rest of the team includes a GSI stainless steel 12-cup percolator with the percolating parts removed and the aforementioned Hydro Flask growler(s) (just make sure to finish the fresh beer in it the night before). 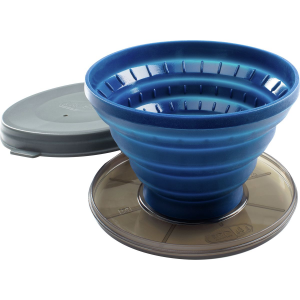 For storage and transport, the #6 silicone coffee cone that comes with the Java Drip folds up into the carafe, then the carafe fits nicely into the gutless percolator. For coffee making, the tall and thin percolator boils the water much more quickly and efficiently on the stove than a standard saucepan (although that would work too...) and holds just a bit more water than the carafe after pouring over the coffee and filling the carafe, enough to allow extra hot water for those oddball tea and cocoa drinkers in the group. 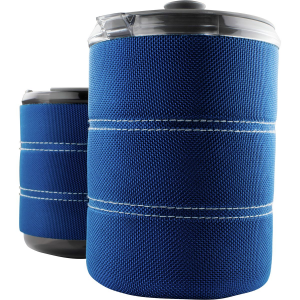 A sight window through the neoprene sleeve allows you to see the coffee level in the carafe as you pour over without removing the cone from the lid to peak in. 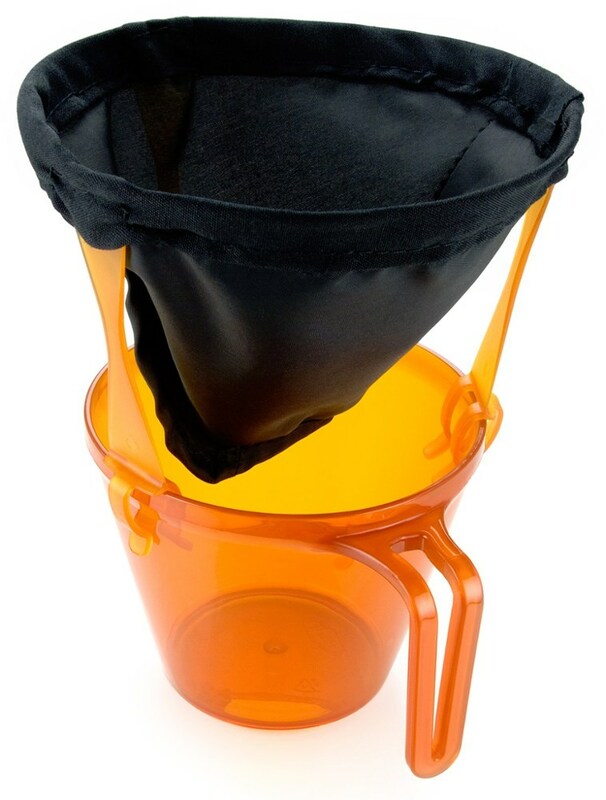 The cone itself is shaped to lock fairly securely in the carafe lid, providing a stable platform that makes spills less likely than the tippy plastic cone holder we used previously to pour directly into the Hydro Flask. When full, the hot coffee is poured into the Hydro Flask growler for storage and pouring into individual mugs of the coffee drinkers while the next batch of coffee is made in the carafe. If we are really rolling for a large group, we'll press two growlers into action. Although it says it is 50 oz, the full capacity of the carafe is actually somewhat larger as it will pretty much fill the 64 oz growler with coffee. The Hydro Flask growler will keep the coffee nice and hot for 12 hours, so whatever coffee doesn't get consumed in the morning can be packed on the boats for an afternoon pick-me-up or a warming drink for unplanned swims. 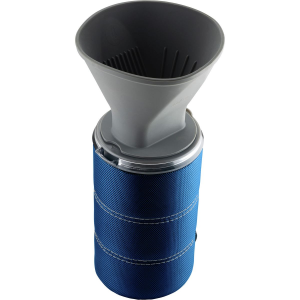 While it comes with a cloth filter for the cone, we use standard #6 paper filters to make clean up easier. The cloth mesh filter gets packed as a backup in case we run out of paper filters. I just picked this up in June of 2015, but have used it all summer on several trips and it has worked really well for how I use it. Unfortunately, I don't see the 50 oz Java Drip listed on the GSI website anymore. Call them directly to inquire about it and they may be able to find you one in the warehouse. They were extremely helpful when I contacted them for assistance. GSI has a slightly revised version of the 50oz Java Press on their website, and Cascade River Gear has the prior version listed. Welcome to Trailspace, Dale! Thanks for sharing such a helpful review of your Java Drip. I hope you'll share some other reviews with us. This product will make coffee, but it will take some time to do it. The coffee blend will depend on you. Makes a lot more than an standard cup. Everything fits in cup when not in use. You need to preheat cup with hot water so boil extra water. Not mentioned but I experienced heat loss. About two years ago when I decided to go camping with a female companion I wondered how I would make my morning coffee. Since she also drinks coffee it would be too easy to bring a plug in coffee maker. I was at a campground which had electric and water and I didn't want to go that easy route so I looked at several options and purchased the JavaDrip coffee system. Nice solidly built,and well designed. 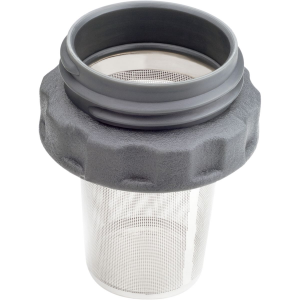 You basically put the cloth filter (included) or a #6 paper coffee filter in the drip cone,and add hot water to the desired level. The coffee then drips in to the cup. Simple yet effective.